After spending years railing against the excesses of the wealthiest Americans, and after refusing to release his full tax returns when he ran for the Democratic nomination against Hillary Clinton, on Monday evening socialist Vermont senator Bernie Sanders released a decade’s worth of tax returns which confirm that, as had been extensively leaked before, he is indeed among those that can be called a filthy capitalist millionaire. The returns show Sanders and his wife, Jane, earned more than $1 million in total income in 2016 and 2017. They earned $519,529 of taxable income in 2018, the sum, of income from his job in the Senate and more than $381,000 in income from book royalties in 2018, and paid $145,840 in federal taxes for an effective rate of 28%. 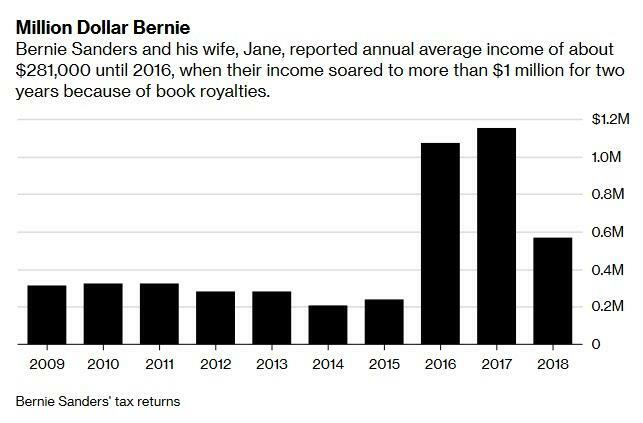 Sanders’ highest grossing year in the past decade was 2017 when his books earned him $875,000 in royalties, resulting in combined income for Bernie and his wife of nearly $1.2 million; they paid an effective rate of nearly 32 percent on that income. In 2016, the couple reported a little more than $1 million, mostly from sales of the book, which was also translated into five other languages. The Sanders’s income has increased sharply in recent years as he earned more from book royalties and gained fame as a presidential candidate. As shown in the Bloomberg chart above, from 2009 to 2015 the couple’s average income was about $281,000. Sanders earned $174,000 annually as a U.S. senator, while book sales accounted for $391,000 of his earnings in 2018; in 2017, the book generated $855,631 in income, up from $840,485 in 2016. “These tax returns show that our family has been fortunate,” Sanders said in a statement accompanying the tax returns, without elaborating why he did not turn around and submit an even greater remittance to the IRS, as he now demands all wealthy Americans should do. Despite their roughly 50% drop in income last year, the Sanders fell squarely each year into the top 1 percent of wealthiest Americans, as defined by a May 2018 study based upon the 2014 tax year by economists Thomas Piketty, Emmanuel Saez and Gabriel Zucman. According to Bloomberg, taxpayers needed income of at least $458,000 and less than $1,960,000 to be in that group. It turns out that besides being quite wealthy – at least for a socialist – there is little in his returns that is disturbing. In 2016, the Sanders’ income increased substantially due to advances and royalties from his best-selling book Our Revolution: A Future To Believe In, which has been translated into 5 languages and published in a number of countries. The youth version of Our Revolution, the publication of Where We Go From Here and an advance on a book currently being written by Jane Sanders, are also reflected in the tax filings. The Sanders under-withheld last year – a common problem for many taxpayers adjusting to filing returns for the first time under the tax overhaul, which changed the withholding tables. Their 2018 return shows that upon filing, they owe the IRS $8,267, after having withheld $22,573 for federal taxes. They paid the rest of their liability in estimated quarterly payments. Their most recent return listed $41,764 in deductions — slightly below average for their income level, according to IRS data for 2014, the most recent year available. The new law limited the ability of taxpayers to itemize deductions by nearly doubling the standard deduction, to $12,000 for single taxpayers and $24,000 for married taxpayers who file jointly. The Sanders reported $381 in taxable interest, $1 in ordinary dividends and $0 in capital gains. What is odd is just how informative his book – supposedly on socialism or some such – was: as Bloomberg points out, Sanders’s book royalties were larger than many of his 2020 rivals. Elizabeth Warren reported nearly $325,000 in income from her book. Kirsten Gillibrand reported about $50,000 of book deal profits. Since 2016, Sanders has published three books, including “Our Revolution: A Future to Believe In,” which he used to launch his last presidential bid. Curiously, just like in 2016 before his campaign was sabotaged by the Democratic Party, which we learned thanks to Wikileaks and which led to the resignation of Debbie Wasserman-Schulz, Bernie is now once again in the lead among Democratic candidates, although with the publication of his taxes he may find it a challenge to manage the disconnect between his decades of rhetoric about the political power wielded by the wealthy… and his own position within that group. Sanders has joined numerous other 2020 Democratic hopefuls (and there is indeed a great number of them) who have released at least 10 years worth of tax returns, including Senate colleagues Warren, Amy Klobuchar and Kirsten Gillibrand. For some bizarre virtue signaling reason – perhaps to demonstrate to their potential voters just how little they make – the release of tax documents has taken on added importance for Democratic candidates who are eager to contrast themselves with President Trump, who continues to refused to release his tax returns. Asked about the whereabouts of his tax returns in an interview with CBS News last week, Sanders said he would release them by April 15. He joked his supporters might be thrown off by “my trillions of dollars of investment in Saudi Arabia or Russia.” Well, no, but they may be thrown off – between Sanders’ own generous income, his three residential properties, and his wife’s somewhat dismal professional experience which left a local college bankrupt – by what some consider hypocrisy .